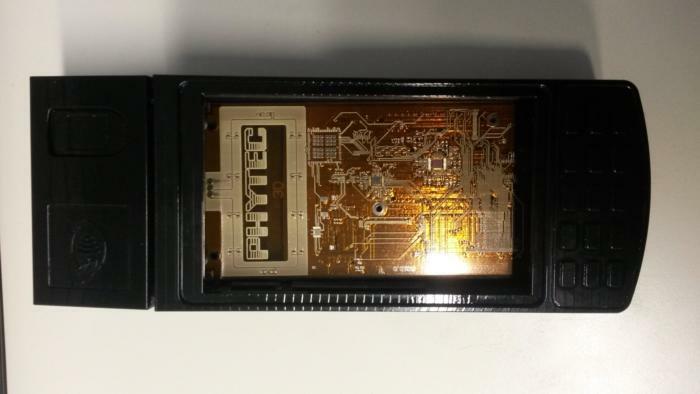 An Israel-based provider of 3D printing technologies and nano-inks is now shipping a desktop machine to beta customers that can produce multi-layer circuit boards. Nano Dimension's Dragonfly 2020 is a desktop 3D printer that can produce circuit board prototypes and small production runs that can cut development time from weeks to hours, according to Amit Dror, co-founder and CEO of the startup. 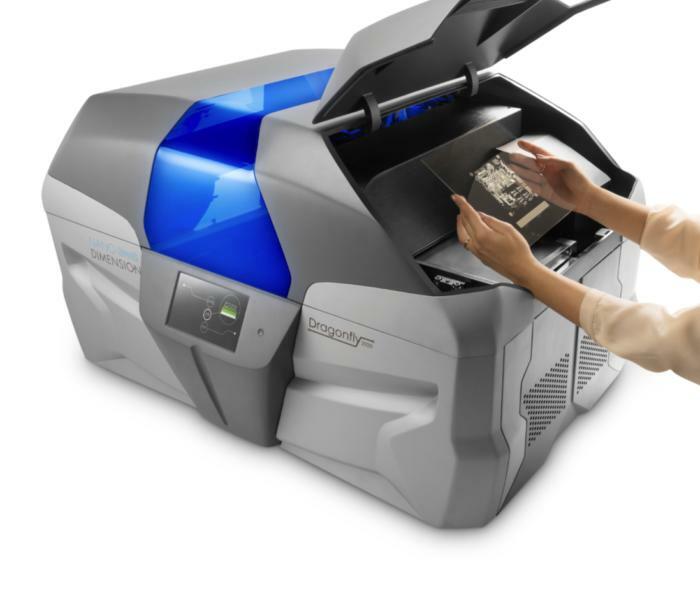 The Dragonfly 2020 uses an inkjet-like material deposition method followed by a heat-based curing system to create the printed circuit boards (PCBs), and it has no limit to the number of layers beyond the mechanical height of the printer's z axis. The printer works by first depositing a dialectic insulating material and a silver-based nano-ink for circuitry on top of it. None of the nano-inks extruded by the 3D printer start at room temperature; before they are desposited on the print platform, they go through process called curing and sintering, which bakes the materials to get rid of solvents, then they are melted further before being extruded, Dror said. A printed circuit board being removed from the Dragonfly 2020 3D printer. "The nano silver particles get melted at very low temperatures -- something like 100 and 200 degrees Celsius," he said. "Once they're sintered, the nano-ink becomes solid silver. It won't melt again until the temperature hits 900 Celsius." "In fact, to our best knowledge, we're only company that can print two types of materials -- dialectic and conductive -- that can withstand high temperatures with high resolution," Dror added. The Nano Dimension Dragonfly 2020 can print conductive traces that are about 100 microns in width; the machine makes several passes to create the width required for one line. When commercially available, the 3D printer will have cost around $200,000, Dror said. The Dragonfly 2020 extruding melted silver-based nano ink. Nano Dimension, founded in 2012, first unveiled the Dragonfly 2020 at the SolidWorks World conference in January 2016. That same year, Nano Dimension was added to Gartner's "Cool Vendors in 3D Printing" report. In that report, Gartner stated the company's printed circuit boards (PCBs) technology "potentially enables scalable production of custom products. This puts Nano Dimension's PCB printer at the convergence of electrical, mechanical and software design and manufacturing." Gartner added that the PCBs could "have unique signatures that make counterfeiting of the item with a custom 3D-printed PCB difficult if not impossible." 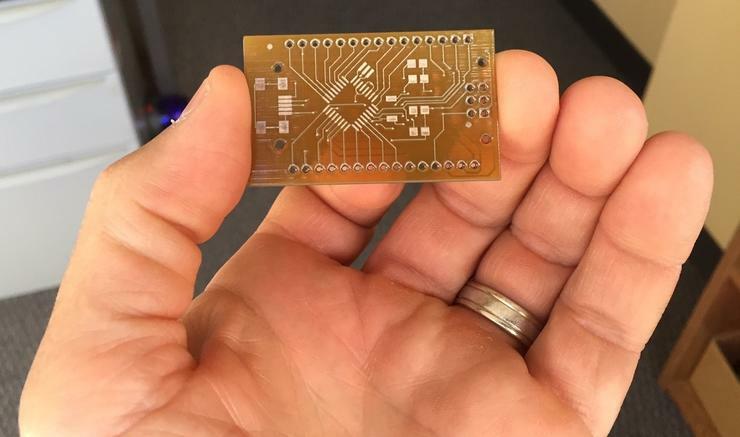 A closeup of one of the flexible circuit boards printed by the Dragonfly 2020. Nano Dimension, Dror said, is now working with 10 beta customers, including U.S. banks, a healthcare company, a defense contractor and electronics organizations. Dror was unable to name most of the companies due to confidentiality agreements. The Global Printed Circuit Board (PCB) market, which was worth $63.5 billion in 2016, is expected to reach about $73.8 billion by 2021, increasing at a compound annual growth rate 3.1% over that time, according to BCC Research. Typically, PCBs manufacturing is outsourced to third parties in Asia. Printing prototypes in-house not only protects a company's intellectual property, but it also allows developers to test ideas that might otherwise be too expensive, Dror said. "It can take weeks to get back a prototype. Being able to create and change a design and get it up for testing within a few hours instead of few weeks is the advantage we offer our users," Dror said. Nano Dimension is not the first company to produce a 3D printer for circuit boards. In 2015, Voltera ran a highly successful Kickstarter campaign to fund its desktop circuit board 3D printer. The Voltera V-One 3D printer, which dispenses conducting and insulating ink to create circuit-completed boards for prototyping, garnered nearly five times its $70,000 crowdsourcing goal. Next month, the company plans to begin shipping its 3D printers, which retail for $2,199. Also in 2015, Harvard researchers announced the creation of a 3D printer that could extrude both thermoplastics and highly conductive silver inks that allow electronic products to be created on one process. The printer, sold by Voxel8, had a base price of $8,999 and saw a limited production run; it is no longer available and the company is currently developing new, "more capable" platform, it said. Terry Wohlers, president of 3D printing industry research firm Wohlers Associates, said he has not recently analyzed Nano Dimension's competition, but noted there aren't many rivals and the company "offers something interesting and special" limited to prototypes and small production runs. In the distant future, Wohlers believes, industrial 3D printers will produce circuits and other electronics that conform to the shape of a device, as well as the plastic enclosure itself. 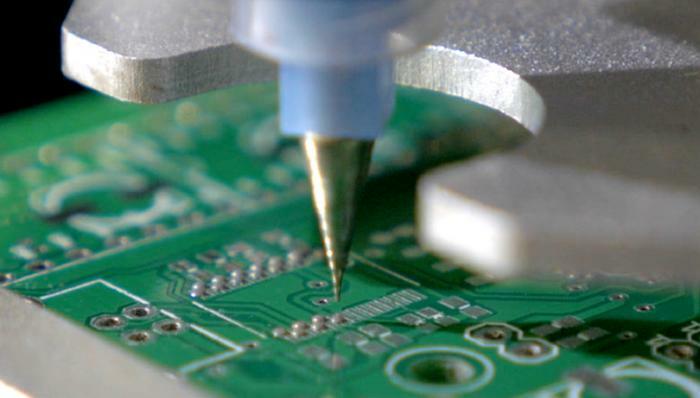 Today, products are designed to accommodate conventional printed circuit boards. A circuit board printed to fit a cell phone's form. 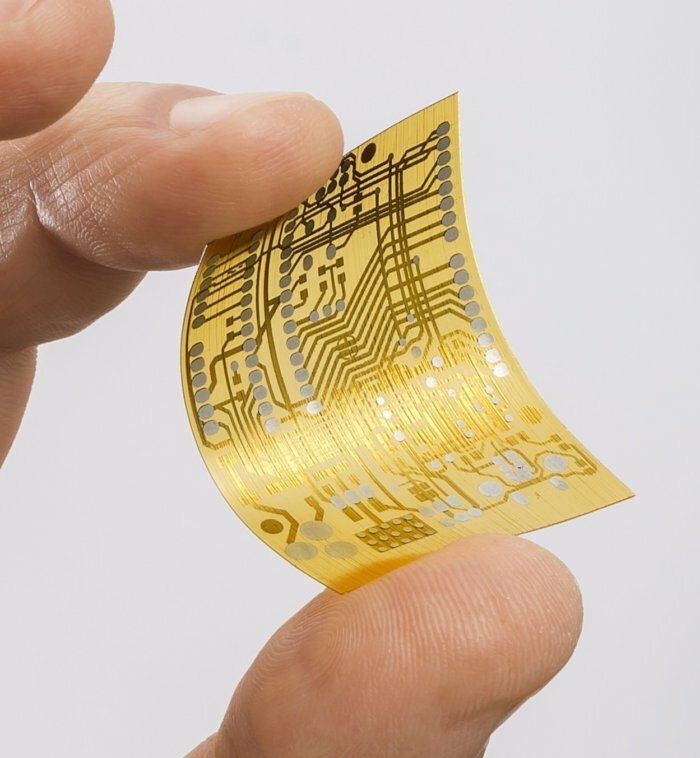 "Over time, the market for 3D-printed circuit boards could become large, but many problems first need to be solved," Wohlers said. "One of them is the printing of multiple materials, another is speed, and a third is cost, especially for production quantities."